Beever M18R Track Tree and Brush Chipper. Morbark debuted the new Beever M18R Track Tree and Brush Chipper, as well as improvements to its Tree Care Products lines, at the TCI Expo. The Beever M18R Track features 400mm rubber tracks, 4.84 psi ground pressure and low-speed and high-speed travel ranges of 1.0 mph and 1.8 mph. Additionally, enhancements in the Morbark product lines include more gasoline engine option and Tier 4 diesel engines. 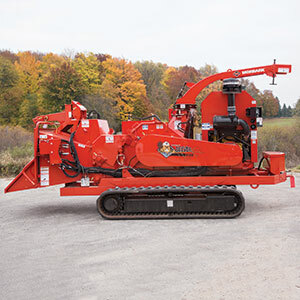 The Boxer line of compact utility loaders will now be Morbark orange. An updated logo, decals and paint color will provide greater synergies between the models in the complete family of Morbark equipment, the company said. Boxer mini-skid steers also will feature new joystick controls.